Longing for the elegant aesthetic of an English country house? Look no further than The Royal Oak Foundation Collection. Each design is inspired by classic British art and architecture found on the properties of the National Trust of England, Wales, and Northern Ireland that The Royal Oak Foundation has supported with over $7 million in grants. The sale of these products generates royalties that support ongoing preservation and conservation of the more than 300 important historic houses and gardens that influenced their design. Available to the trade exclusively at Lee Jofa showrooms in New York, Atlanta, and elsewhere, The Royal Oak Foundation Collection includes Lee Jofa fabrics, Holland & Company furniture, Cole & Son wallpaper, and Katha Diddèl home accessories. Gayle Warwick Fine Linen introduces a dazzling array of new tabletop linen – embroidered by hand on Irish or Belgian linen, this collection is heirloom worthy, but without the fuss. Your grandmother, were she a mother of three balancing a high-powered investment career with quiet dinner parties at home and chic vacations in the Hamptons, would certainly approve. 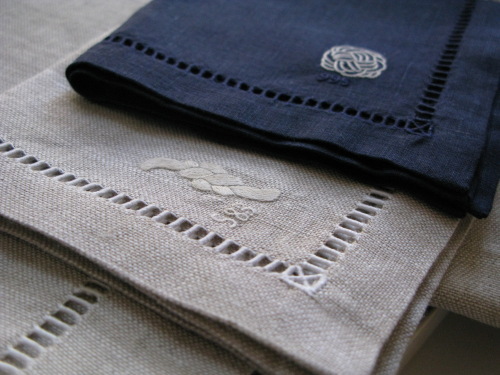 For the past two years, Gayle Warwick Fine Linen has worked on constructing the perfect, and perfectly organic, white cotton towel. Gayle Warwick worked with expert weavers in Switzerland to design and construct the terry towel that uses 100% organic cotton and is bleached pure white using no chlorine – both elegant and ecological. Proof that going “green” doesn’t have to mean sacrificing daily luxury! Tired of slipping in the middle of downward-facing dog? Pick up one of COMO Shambhala’s eco-friendly yoga mats, made entirely from natural plant-based materials and totally PVC free. For easy cleaning, pop them in the washer, set it to cool, and air dry – think offsetting your carbon footprint. And FYI: we hear it’s the must have accessory for COMO Shambhala’s exclusive yoga retreats. $118. Nantucket Island Resorts is the first hotel brand to use Gayle Warwick Fine Linen hand-embroidered, 100% organic cotton sheets. The sheets are embroidered with a cheery pattern of marching elephants, specially designed to reference the hotel’s mascot, Trunket.